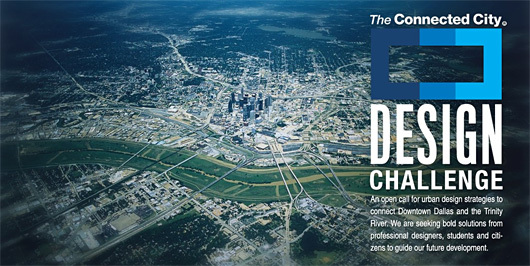 The Connected City Design Challenge will build awareness of urban design solutions capable of shaping Dallas forward, develop a more refined and specific strategy for connecting our downtown and river, and assist in securing future public and private investment. By empowering both designers and citizens, The Challenge will work to realize integrated solutions that improve the livability and viability of our city. In order to secure the most capable design talent and facilitate a variety of solutions, The Connected City Design Challenge will be structured as a competitive process consisting of two idea streams: a professional stream and an open stream. From the Professional Stream, the jury will select three design teams through a competitive request for qualifications process. The selected design teams will be awarded $50,000 to bring their expertise and ideas to the challenge and up to $10,000 covering travel to Dallas. The Open Stream invites professionals, non-professionals, and students to submit design proposals. By a combination of popular vote and jury selection, four finalists will receive $5,000 each and participate in the public exhibit and activities. Public events will include a symposium and lecture series by all three professional teams and panel discussions including the open stream finalists.